Golf courses, municipalities, even families trying to ration their water consumption rely on inexpensive and durable water meters, like the TM Series Digital Flow Meter sold by Assured Automation. Water meters provide a quantitative analysis of water consumption reduction efforts, and by calculating irrigation volumes, they enable golf course superintendents to effectively manage water consumption and avoid costly municipal fines. Water management efforts are being implemented at golf courses across the country to deal with the growing economic, environmental, and humanitarian effects of excessive water consumption. According to the Center for Irrigation Technology, the US uses approximately 476 billion gallons of water each year to irrigate its golf courses. In a world where water represents a finite and vital resource, these consumption rates pose dangerous consequences. A United Nations Environmental Program report in 2007 estimated that by 2025, there will be 1.8 billion people across the world who live in “conditions of absolute water scarcity, and two thirds of the planet will be subject to water stress”. The United Nations reports it will require 2.5 billion gallons of water each day to sustain the world’s 4.7 billion people. Today, the cumulative amount of water used to irrigate the world’s golf courses is just that: 2.5 billion gallons every day1. And the cost of water is on the rise. Everywhere. With the exception of 2005, the Boston Water and Sewer Commission, in Boston, MA, raised water rates on companies and residents every single year since 2002. Residents of San Diego, CA have seen their water rates increase 67% over the last three years2. In 2010, Houston TX raised rates nearly 30%3 New York City has increased water rates by an astounding 134% since 20024. Over the last five years, the municipal costs of water have jumped by an average of 27% across the US. These increases in water costs can seriously threaten the economic viability of a golf course. In 2010, the city council in Lake Havasu City, AZ approved an effluent water rate increase that raised the cost of golf course irrigation from $52 to $144 per acre/foot5, 6. By 2014, golf courses in Lake Havasu City will pay roughly $330 per acre/foot. This means that the water costs for golf courses in Lake Havasu City will jump over 630% in four years. Already, the Environmental Institute for Golf estimates that the average 18-hole golf course facility in the United States Southwest faces water costs exceeding $107,800 annually7. Eagle Ridge Golf Course of Lakewood NJ settled for $25,000 for exceeding the allowable un-permitted 100,000 gallon daily. Shore Oaks Golf Club, in Farmingdale NJ, settled for $50,000 over claims that Shore Oak’s irrigation exceeded the daily 100,000 gallon limit without proper permits. Westlake Golf and Country Club, in Jackson NJ, settled for $15,000 for excessive water usage8. Efficient sprinkler systems, TDR moisture meters, the selection of grasses on a course, the height at which the grass is maintained, the amount of shading the grass receives from trees, and the rate at which the soil is aerated are all factors that can lead to significant decreases in a golf course’s water consumption. But the only way to monitor these decreases, the only way to audit and verify the effectiveness of a superintendent’s strategies, the only way to monitor the daily, weekly, or monthly levels of water consumption is through the implementation of water meters. 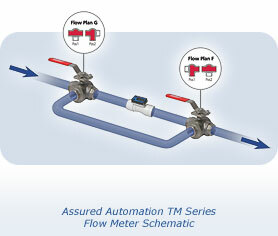 For more information regarding water meters, visit https://assuredautomation.com/TM/index.php. In order to properly install Assured Automation TM digital water meters for irrigation at golf courses or nurseries, first flush the water lines upstream of the meter. Doing so will remove any buildup in the water lines and will protect your new meter as it is installed. Then place the meter into the line with the meter face easily viewable for inspection. It is necessary to attach the meter with the arrow pointed in the direction of the water flow. A bypass line should be installed as well. When water flow is started from a cold start through the water meter, it is possible that too much air will be in the line, causing the meter’s turbine to over-spin and then burn out the meter’s bearing. A bypass line allows the upstream section of the line to fill with water, minimizing the amount of air in the line and protecting the meter. Once the downstream line fills with water, the flow can be diverted from the bypass and sent through the water meter. By installing a 3-way valve upstream and downstream from the water meter, the meter can also be isolated for maintenance or replacements. The distance between the meter and the upstream 3-way valve should be 10 times the pipe’s internal diameter to keep consistent pressure in the line. For example, if the pipe diameter is 2″, the 3-way valves should be placed 20″ from the upstream end of the meter. For the downstream end of the meter, place the 3-way ball valve at a distance of 5 times the internal diameter of the pipe. The Assured Automation digital water meter can be installed in-line either horizontally or vertically or at the end of the hose adjacent to the nozzle. Installation to metal connections is not recommended for the TM Series flow meters. TM Series meters are available with either a computer for local electronic display, or a conditioned signal output module to provide a digital signal to customer interfacing equipment. TM Series meters with computer display measure in gallons or liters. Verify that the water meter is in place and ready for use before turning the water flow back on. Once this has been verified, slowly open the valves that were turned off prior to installation. Turning these valves open too quickly can flow into the water meter too quickly and damage the unit. Verify that water is flowing through the unit and perform a leak check to ensure that the water meter has been properly sealed. Once you have checked for leaks, open all valves. This entry was posted in Flow Meter Case Studies, Flow Meters, Installation and Training, Latest News and tagged 3-Way Ball Valves, Bypass Lines, Digital Flow Meters, Digital Water Meters, Flow Meters, PTP Series, PVC Valves, PVC Water Meters, TM Series digital water meter, Water Conservation, Water Meter Installation, Water Meters. Bookmark the permalink.